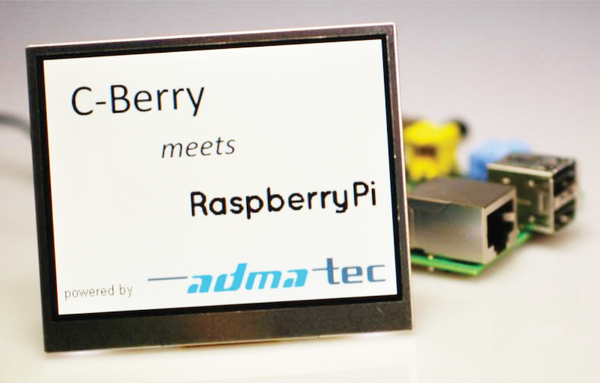 The LCD module C-Berry designed by Admatec comes as a 3.5-inch diagonal TFT screen . It also includes an adapter for the GPIO interface of the Rasp Pi, which makes it possible to integrate the hardware without much effort into your projects. The screen has an off-the-shelf price tag of about EUR 40 at dealers like Conrad or ELV Electronics. The easy-to-understand documentation for the module and the source code that accompany it form a solid foundation for building your own applications. You will be able to create programs quickly that can be controlled from one script. This solution is just right if you want to supplement the QR code player  presented in the previous edition of Raspberry Pi GEEK with a graphical output feature. The player as described already lets children select the music they want to hear through with the use of QR codes and a small remote control. It would be nice, however, if the player could provide ongoing feedback about its operating status. Hooking up a full-fledged monitor and a bulky X server does not sound practical, because the player is supposed to help protect CDs from the rough and tumble of everyday life in a play room. Adding a monitor would defeat the entire purpose of the music player. LCD modules can function with limited power input. The module considered in this article uses just 2 watts, and with its 3.5-inch diagonal dimension, it is suited for incorporation into your own hardware. One inherent disadvantage of this kind of module is that you are responsible for arranging the output of graphical elements and text because the X server does not drive these. The effort required to arrange this output varies according to the use to which you put the module. The C-Berry module (Figure 1) can display 320 pixels horizontally and 240 pixels vertically. It emits a relatively strong 600 lumen, which means the visual display is easy to see even in daylight. At 5 volts, the module pulls about 350mA from the GPIO port and thus does not need its own power supply. Figure 1: The LCD module C-Berry takes up the entire GPIO port but loops through the unused connections. Although the adapter takes up the entire GPIO port, it loops through the unused connections. Therefore, it is definitely possible to run other projects that access the interface in parallel. The controller is set up to output simple graphics, text, and bitmaps. You can combine these elements according to need. For example, you can place text on top of bitmaps or even create diagrams by means of graphical elements. The example programs provided by the manufacturer show that the programming process for combining elements is relatively uncomplicated. The graphics controller also has external typeface storage into which you can load your own fonts as needed. The LCD module comes in three parts: the basic TFT screen, an adapter for the GPIO port, and the connection cable that runs between the adapter and the screen. To put the parts together, you just connect the flat ribbon cable to both the screen and the adapter and then plug the adapter into the GPIO port. You need to make sure the ribbon cable is positioned correctly: Be sure the metal contact points on the cable point upward and away from the board when it is connected (Figure 2). Figure 2: The construction of the C-Berry is straightforward, as long as you make sure the cable is in the right position to be plugged in.